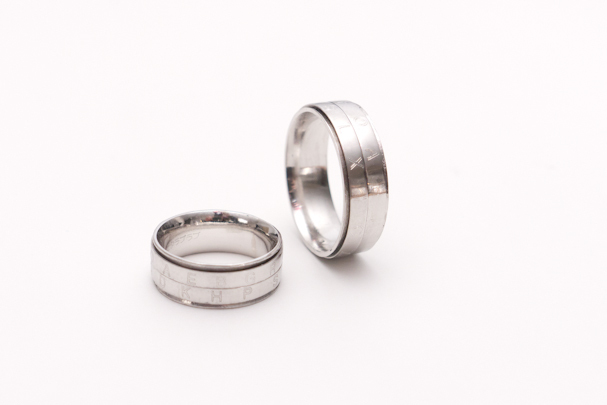 These rings were ordered by American couple and they had an idea the ring design as if a cypher tool. For an instance,when husband sends wife just random alphabet message and then only she can decipher that message using the key codes. They’d like to make such custom functional design ring which can be secret key codes. The rings are double structured, outer rings roll individually and several alphabets were designed by customer are engraved. The inner ring is curved and comfort fit for finger. All of their parts were made from melted platinum metal and were hammered by goldsmith technique. I become glad feeling when to imagine their rings are used for deciphering.